episode 87 – where there were 300 sheep! 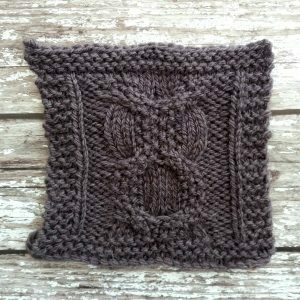 This month’s woolly mucker is Susan Hobkirk, aka macpark, on ravelry. Susan is a long time supporter of all things KnitBritish and I thank her so much for sponsoring the show. Currently she is knitting the Houlland Hap, in Exquiste from WYS and she is almost finished Marie Wallin’s Fair Isle Blanket KAL. Tune in to hear us chat later in the show! I had a great time away – this was my view from my Shepherds Hut! I also managed to do some knitting on Hadrian’s Wall, as you do! Susan talks about the first thing she was taught to knit (something that many of us run from!) and the first garment she remembers casting off – the return of the entrelac sweaters! 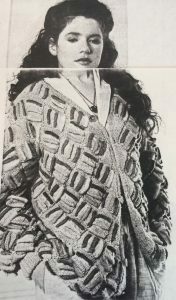 Susan can’t remember who designed this sweater, any eagle eyed KBers know it? Susan also talks about her favourite yarn and pattern in our woolly mucker questionnaire. Like many of our muckers, Susan struggled to pick just one yarn, but listen in as Susan is keen to share her favourite yarn with you, dear listener. Susan, it was awesome talking to you. Thanks so much for supporting the podcast. | Holly Hock Flock – Yarn giveaway from Susan! 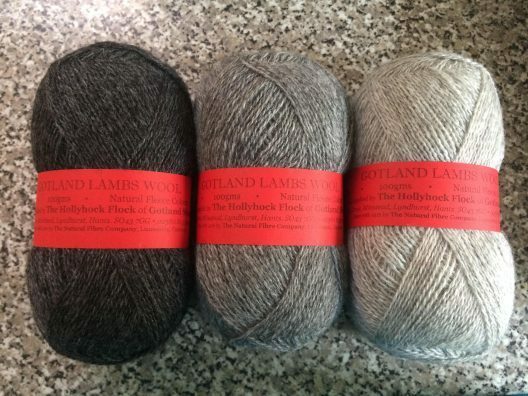 Susan recently discovered Holly Hock Flock Gotland lambswool and when she visited the farm she was so taken with the natural shades that she bought the three natural colours as a prize for you. That is totally generous of her, indeed! The each skein is 100 grams and it is 4ply weight. Fling yourself over to the ravelry group to be in with a chance of winning (lurkers, please enter too!) I will close the giveaway in a couple of weeks and draw a winner at random soon after. Thanks again to Susan for being so very kind. I sent some more mystery yarn off to some of the muckers recently and this time it was wool that I bought at Edinburgh Yarn Fest, back in March. The wool is Welsh Mule from Cambrian Wool and I was really drawn to their wool. Cambrian Wool are a community interest company. 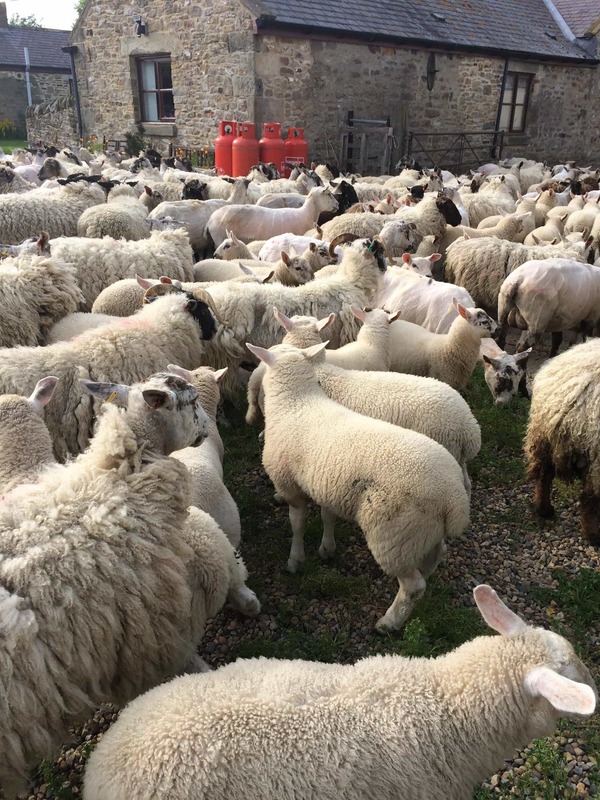 The aims of Cambrian Mountains Wool CIC are to facilitate the purchase and processing of, in commercial quantities, the wool produced on the region’s farms and they make a Welsh mule in 4ply and DK and also a Llanwenog yarn. I knit swatches in the Mule yarn soon after buying it, but I purchased a tester pack so I could send out some to some willing muckers. Again I only told them it was a DK and gave no other info. This time our reviewers were Malyin Scott and Woolly Muckers you will soon meet – Anthea Willis and Carolyn Sue Jenkins. ETA: I am a TERRIBLE TERRIBLE host – I utterly forgot to include a review by Alison Maybe too – I can only think it is because I received her review in such good time I totally glossed over it! Apologies, mucker! It’s not in the audio, but I include it below! First squish: was very firm and smooth. There was the slightest of halos but it took the dye very evenly and it’s one solid, matte colour, which leads me to suspect the original wool is white/cream/light grey possibly a blend with another white, short lustre breed. Lleyn? Southdown? Maybe even a little Shetland thrown in, though it doesn’t feel like pure Shetland. I cast on with a 4.5mm needle and knit a swatch of twisted eyelet rib as I wanted to test both lace and texture with this yarn. After blocking, both types of stitches came out beautifully. I wore the swatch next to my skin for a day and while I did notice it when it moved against my skin, it was by no means prickly or unpleasant. It’s just crisp and thus noticeable. I would have no qualms at all about wearing a garment against my skin. This is a lovely all-purpose yarn that seems perfect for cabled jumpers. Also hats and mittens. I think it would be fairly hard-wearing. While vigorous rubbing and wringing and pulling has disturbed the fibres so that the overall halo is slightly more prominent, I’ve not seen any actual signs of pilling. The swatch after wearing, retains its shape and stitches and feels strong but a little bouncy too. First impressions: Soft, squishy, light and airy with a very slight halo. Smooth with a good twist. Lovely colour! 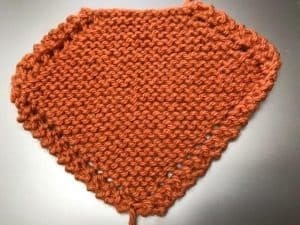 Garter stitch is squishy but firm, stocking stitch is smooth, different textures stand out well. Fabulous stitch definition! Conclusion: Lovely yarn that washes and blocks well. Seems pretty hard wearing and produces a lovely looking fabric. I would use it for cables and textured stitches and I think it would make a fab cardi or sweater or warm cosy accessories – hats, mittens and cowls. When the yarn first arrived it looked very “sturdy” to me although it had a soft feel to it and a bit of a halo. I thought there might be alpaca in there, but the swatch has no drapiness to it at all. I got out my wpi tool and figured out the yarn was a worsted weight. On size 5 U.S./3.75 mm, the gauge was 5.5 st/9 rows/in. 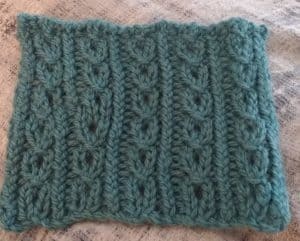 I knit it up as a washcloth to see it in garter stitch with a few yarnovers around the edge. It washed and blocked a lot softer than it seemed in the ball. I just laid it out flat to dry. The garter stitch looks great but the yarnovers disappeared quite a bit in the drying process. I put the swatch inside a sleeve, wore it all day and forgot about it until it fell out at the end of the day. That means it was a lot softer than I expected it to be even though I can’t claim to be very sensitive to the “prickle factor”. The yarn was very nice to knit with, slipping through your fingers, staying put on metal needles and not splitting a bit. And here is my wee video of playing with the finished, blocked swatch of my own. I love this pearly grey colour, don’t you? Isn’t it fantastic to have different knitters with different needles and knitting styles try out this yarn for you? Its such great dimensions to a review. The Cambrian Wool Welsh Mule is just lovely. but my only negative point is that the label on both the mule and llanwenog yarns are exactly the same, no info on which breed is in the ball. As part of my #clearlabelling focus, I will write to Cambrian Wool on the importance of this info and report back. How it knit: smoothly, no splitting. Amazing stitch definition and a sturdy elasticity to the swatch. Ideal for: Sweaters! and everything else – a great work horse yarn but with a bit of luxury about it. I’d make Angelus Novus, Pokiha shawl and try Farlam in the DK, while the 4ply would be awesome for Woolly Wormhead’s textured hats! The Cambrian Wool costs £5.99 per 50g ball and the Welsh Mule is available in a really lovely colour palette. Thank you for recent feedback on the topic of clear labelling. I’ve written to a few companies on your suggestions and will report back with replies either to you individually, or via the podcast (or both!). I’m thinking to come up with a standard letter that you could use, if you wanted to write yourself. There is a huge misunderstanding of what matters to you – the yarn buyer, the crafter – and what we need to see on that label. It is a conscious need for information and having that adds to so many things, not to mention a satisfaction and well being to know where that wool has come from. If there are blanks to be filled in, where those blanks can easily be filled in, then that information should be available. July is already a bit of a crazy month, so I hope to bring you my Uist episode as an extra show this month. My intentions are good, but I know you will be patient if something else crops up to make this month crazier. Extra episode aside I will definitely have an episode for you week after next in our usual spot! Happy knitting til then! Take good care! Music: Carefree by Kevin McLeod and Singin’ in The Rain (demo) by David Mumford – Both are on FreeMusicArchive and are both shared under Creative Commons Attribution license. Images are copyright to those attributed in the caption or in the accompanying information. Other images are mine. I purchased the Cambrian Wool for the purposes of review. All reviews on KnitBritish are honest and all information is correct at time of recording. I love love love the wooly mucker’s blind tasting… It’s really fun. the wooly muckers are a GREAT addition to the podcast. Louise, keep up the great work. I always enjoy listening to you, and you have widened my knitting world enormously! thank you! thank you! thank you! Lovely to be able to listen to you from holiday in SW France. Wifi is a wonderful thing ! Visited an eco museum near Sabres in les Landes where, wonder of wonder, there was a demonstration of the work of countrywomen at the turn of the century – lots of spinning, knitting and dyeing . I got some marvellous photos Knitbritish listeners might enjoy, will try to post them to the Ravelry group. Not British, but definitely local wool! I have staggered myself with my technical prowess . Photos now on Ravelry thread for this episode for everyone to have a look at. Hope you enjoy them as much as I did . Thank you Louise for another great podcast which I always enjoy very much. I have this pattern! – Kimono, Susan Duckworth, in her book simply called ‘Knitting’ published 1988. Oh, you are quite right…I have the book too it is a great example of 80’s knitting at its best..however, I missed the Kimono pattern when I looked through! Glad you have found the pattern. On the podcast you mentioned The Sweater Book by Amy Carroll. I still have my copy of this book, my Mum sisters and I knitted several of the patterns from it. I still have one of them, knitted for me by my Mum – I have put it on Instagram (Brend_Mc), have a look! Wool labels need to have WPI marked on the. That means wraps per inch. It is used in Handspinning and gives an excellent idea of the thickness or “grist” of the yarn. Hi Louise. I’m a fairly recent listener living in Colorado in the US, but I’ve been binging on your podcast, and I’ve made it through all of them! I wanted to tell you that after listening to Susan Hobkirk gush over the Hollyhock Flock yarns, I decided I needed to try it. I contacted Sue Cole by email, and she agreed to send yarn to the U.S. by her mule (her husband), so that the shipping would be affordable. Nice, right? I just have to say, I received the yarn today, and it is amazing! It’s so beautiful. I got all three colors in the 4-ply. The lightest shade is almost silver and has a beautiful sheen to it. When I opened the package, I stuck my nose right in for a whiff and thought of you. So sheepy! And it’s very soft and squishy. If you haven’t yet gotten some of this yarn for yourself, you really should. Thank you for a terrific podcast. I discovered KnitBritish before Christmas and have now listened to them all! I particularly love the Woolly Mucker episodes and listen to them again and again (usually while I’m cooking dinner), Thank you for all you do for British wool – I’ve learned loads from the podcast and it has rekindled my love for knitting. Next Postepisode 88 – The one with Shetlands, Romney, Alpaca, BFLs, Merino, Mules and silk!